why does congress exaggerate the national debt? Is congress making the $18.043 trillion national debt a political issue? Do they realize that we should only be concerned with is the foreign, $5,048 trillion debt, because the remaining part, $12,995 trillion, is held by the US public and would take a huge tax raise to pay it off. [+3] - engineer - 01/23/2015Debt is debt. I have savings bonds and if the government suddenly decided that its debt to me is not really important, I would not be a happy camper. They can make it political because people do not understand macroeconomics. The US economy is the strongest in the world that generates 22% of the GDP. Quite a feat. Debt is debt. I have savings bonds and if the government suddenly decided that its debt to me is not really important, I would not be a happy camper. Do they realize that we should only be concerned with is the foreign, $5,048 trillion debt, because the remaining part, $12,995 trillion, is held by the US public and would take a huge tax raise to pay it off. There is no difference between debt held by an American and debt held by a non-American. They both need to be paid off. The economic consequences for each are exactly the same. So would you all be more happy if congress raised taxes on everyone down the line in order to pay off the debt? Or do we cut down even more programs designed to help the poor and disabled? Or do we just increase the tax rate to the rich who have been benefiting so heavily while the poor have been getting poorer and the middle class has been shrinking? I think the last one, naturally. What do you think? I think what I observe are many contradictions about our economy. Our country represents only five percent of the world population, but produce 22% of the GDP. Travel and tourism continues to grow with many of the mega ships filled to capacity. People are spending money to buy homes and cars. Consumer spending makes up 70% of our economy and jobs continues to grow. Even with all these positive trends, we hear about people struggling. I just wonder what percentage of our society really fits this group. Too much info, but thanks for trying. That chart really doesn't explain the fact that social benefits people of poverty receive. I read a study recently about this subject, but forgot where or when. Well of course social programs helps people who live in poverty or near it or are disabled or elderly. 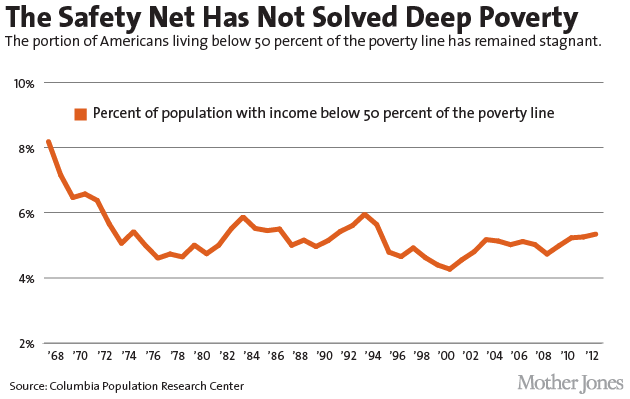 The point is that we have not solved the poverty problem in the US, it has remained stagnate for years. Moreover, in recent years, the middle class has been shrinking as well. Well, I don't know it used to be the American dream. We all understand that, but the conservative trickle down theory was a disaster. I am not sure why you responded with that, I never mentioned or implied being in favor of the conservative trickle down theory. In any event, I think we stretched this line out as far as it can go. The facts are we do have national debt and we still have people in need of social programs as poverty is as high as it ever has been. So we only have a couple of choices, either cut down more on social services or other government expenses, ignore the debt, or raise taxes either on everybody or mostly on the top richest in the country of which congress never will agree to because they are beholden to them in order to stay in office. Because, it's relevant - even if you can't see it. It got us to where we are today. I just love how you always assume things, "even if you can't see it." However, you just threw it out there as though in answer to something I said. Never mind, it is not worth it. » why does congress exaggerate the national debt?